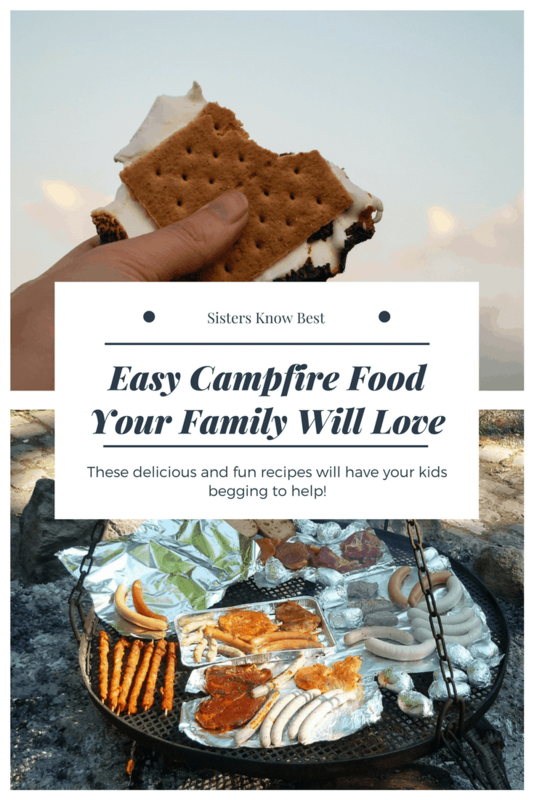 We love campfire food and camping out during the summer! 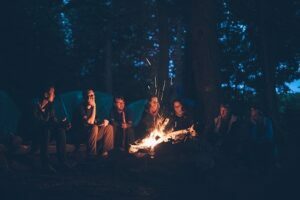 It’s great bonding time with the family and there’s really nothing like sleeping under the stars and making memories around the campfire. Fellow campers know that one of the more enjoyable parts of camping (once you’ve set up your tent, of course) is cooking over the campfire. It’s lots of fun, but so often winds up with burnt food or hot dogs lost to the flames. Ugh! Instead of that huge bummer, give these easy campfire food ideas a try! For some reason, sleeping outside really builds up an appetite. We think it has something to do with fresh air, but we don’t really know. What we do know is that everyone wakes up crazy hungry and wanting a big breakfast. Day old granola bars are not going to cut it. We’ve got some fabulous campfire breakfasts your whole family will love. This recipe calls for beer, but it’s definitely not required. So if you’ve got young ones along or simply don’t want a brew first thing in the morning, just skip that. 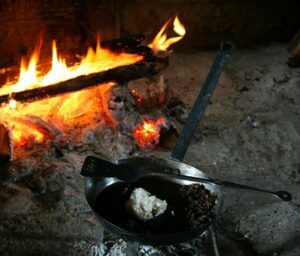 We had no idea making pancakes over a campfire was even possible! Just make sure you bring you cast iron skillet. Cast iron is the way to go when making campfire food! At home, we love eggs, ham, and potatoes for a hearty start to a weekend morning. 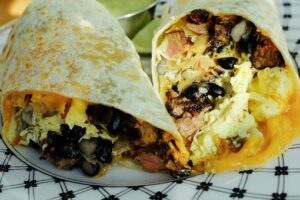 Until we found this recipe to make them all in one skillet, we figured our favorite morning meal was a no go for camping. We can’t believe how great it tastes and nothing winds up overcooked! In between ghost stories and snoozing in our sleeping bags, we like to hike, play games, and have family sing-alongs. At some point, though, everyone’s hungry again and wants lunch. We used to pull out a package of hot dogs and some metal skewers and caution everyone not to get burned or drop their dogs in the fire. We’re sure you can guess how that went! Thankfully, we’ve discovered these awesome campfire food lunch recipes instead. You don’t need an oven to make the most delicious nachos. We honestly weren’t sure how this would work, but they came out great! Cheesy and gooey just the way nachos should be. Everyone was impressed and they liked this lunch a lot better than those hot dogs AGAIN! If you’re looking for something a little healthier that will still leave everyone satisfied, these chicken and veggie foil packs are perfect. They’re a nutritious meal all in one easy foil pack. And no cast iron skillet needed. Just use tinfoil and the heat of the campfire to cook up a tasty lunch. 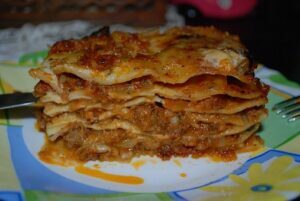 That’s right, we said lasagna! You will need a Dutch oven, but other than that, there’s nothing to it. It’s almost easier than making lasagna in the oven at home! And it just might taste even better being eaten in the great outdoors. Everything else does! After a full day of hiking, biking, boating, etc., everyone makes their way back to the campsite and they show up ravenous! 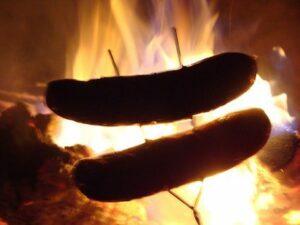 A big dinner is in order and these tasty campfire food dinner recipes are just the way to satisfy those big appetites. These are great on a bun or as is. However you choose to serve them, sausage, peppers, and onions make a filling end to a day spent enjoying all nature has to offer. Vegetarians and carnivores alike will love this red beans and rice recipe. It’s a lot easier to make than you think! Pro tip: bring your spices pre-mixed in a Ziploc bag or Tic Tac box. Hot dogs are pretty traditional and sometimes we still want them. Now, we have a better way to make them! And we get to add the carbs my family needs for an active camping trip with potatoes. Sure, you could make S’mores, but there’s so much more to campfire food desserts. Besides, if your S’mores come out anything like mine, they’re not the best dessert you’ve ever had. A twist on S’mores that’s a lot less messy and, we think, a lot more fun to eat. Just make sure you have a safe way to carry in your waffle cones without breaking them. Wow! We love strawberries in the summer and this is such a great way to enjoy them around the campfire. 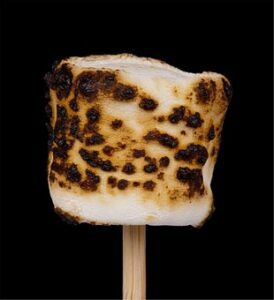 Plus, you get to practice your marshmallow roasting skills. These campfire strawberries are super fun to make and even better to eat! We had no idea you could make cobbler over a campfire! You’ll need your Dutch oven to do this right, but the results?! It might even be better than a cobbler made in the oven at home. If you’ve got a way to keep it frozen, this is great with some ice cream on the side. 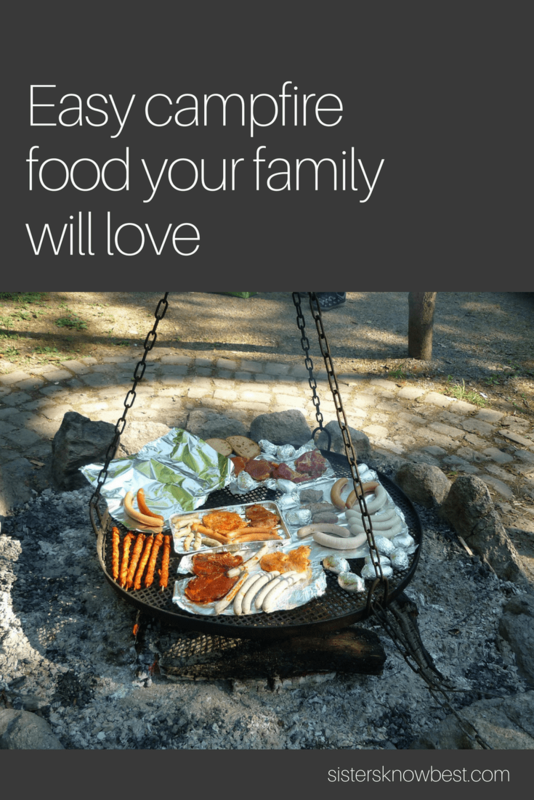 What other great campfire food meals does your family love? 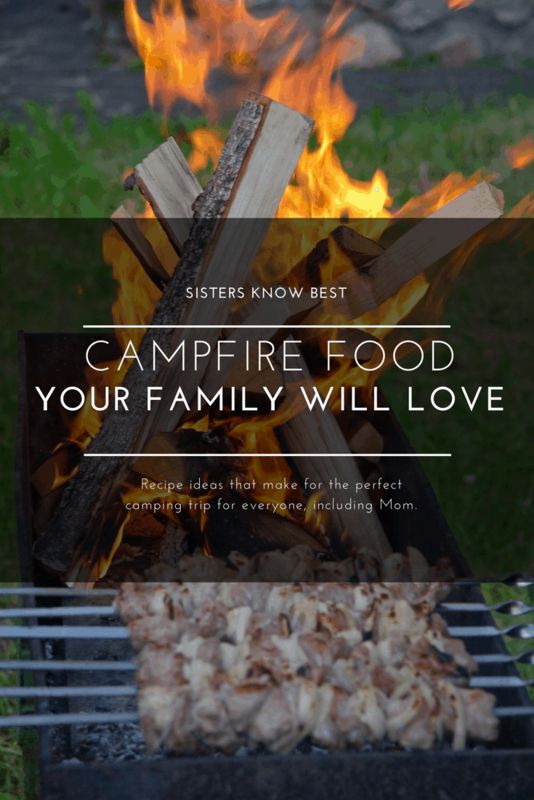 We’re definitely make some of these campfire recipes part of our summer tradition! 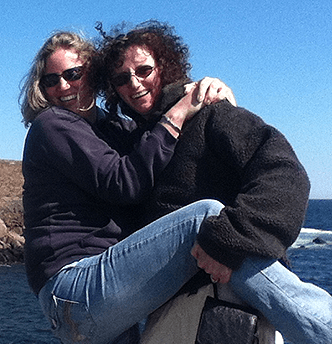 Hey, have you seen the new site OurWares.com? Great place to compare camping gear. Check it out!